In its prime, Ceyatatar was a remarkable city which prospered through trade with the Heartlands around the White-Gold Tower. 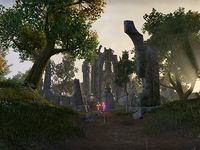 According to Cyrodilic legend, "Ceya-Tar" was the seat of the Fire King Hadhuul, a particularly cruel Ayleid ruler. In his realms, slaves were drugged with foul concoctions that induced visions of torment, and their children were set aflame for nighttime tiger sport. The sorcerer-king was later slain in single combat on the granite steps of his city by Pelinal Whitestrake during the Alessian Slave Rebellion. King Hadhuul's spirit, along with spirits of his army and some Flame Atronachs, reappeared at Ceyatatar during the Planemeld in 2E 582, but these invaders were banished by soldiers fighting in the ongoing Alliance War before they could harm the nearby settlement of Vlastarus. 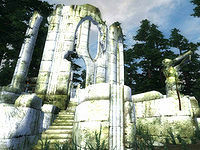 By 3E 433, the ruins of Ceyatatar had been taken over by a group of conjurers and their summoned Daedra.